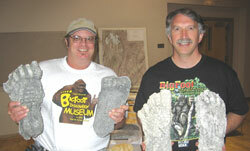 "The Bigfoot Science Conference in Pocatello 2006 "
and Dr. Jeff Meldrum show off Sasquatch footprint casts. In mid-June the city of Pocatello, Idaho, hosted the Bigfoot Rendezvous, a conference that included a film festival, storytelling, live entertainment, an exhibit at the Idaho Museum of Natural History on how people "know" about the Sasquatch, and a symposium described as "featuring regional experts and eye-witnesses as well as nationally known figures in the search for North America’s great ape." About 100 participants attended. Speakers included wildlife biologist John Mionczynski, who retold stories of investigating Bigfoot encounters; US Forest Service archeologist Kathy Moskowitz-Strain, who spoke on the Hairy Man pictograph; and Uganda National Parks’ former park warden, Owen Caddy, who analyzed the famous shaky Patterson-Gimlin film, allegedly of the Sasquatch. Normally, news of a non-peer reviewed Bigfoot conference wouldn’t grace these pages. But the Bigfoot Rendezvous ran into controversy when it was billed as a "scientific symposium", in part due to its attendance by Jeffrey Meldrum, who has a PhD in physical anthropology from State University of New York at Stony Brook and is currently an associate professor at Idaho State University in Pocatello. However, local critics felt this didn’t justify a "scientific" label. Nonetheless, Meldrun thinks there’s something to alleged Bigfoot footprints. "In 1996, I was shown some [Bigfoot] tracks outside of Walla Walla in Washington," says Meldrum, "and I literally got knocked back on my heels." Meldrum says he became convinced the tracks were "living" and bear resemblance to primate foot anatomy. He has been collecting similar tracks ever since, racking up a collection of about 200 examples. It was because of this work that Meldrum was invited to speak at the Bigfoot Rendezvous, an otherwise amateur conference, as its only appointed academic. Meldrum says the museum exhibit seemed the most popular part of the conference. Meldrum’s high point was a panel of Native Americans from the Shoshone-Bannock tribes, which shared their cultural insights on the Bigfoot. Plus, "there where costumes, funny movies, and all sort of Bigfoot paraphernalia," says Meldrum. The conference also sparked a controversy. For Martin Hackworth, a senior lecturer in the physics department at Idaho State University who was asked to help the museum put together its exhibit, Meldrum’s presence at the Bigfoot Rendezvous didn’t turn it into a scientific conference. Hackworth, who writes an anti-junk science column for the local newspaper, emerged as the leading critic of the scientific aspirations of the event. "I originally wrote a letter to the local newspaper saying I think a Bigfoot conference is fine … but that it can’t be billed as a scientific conference," says Hackworth. "This started a furor." Numerous letters were exchanged in the local newspaper, and it became quite heated, says Hackworth. Meldrum says that although he had no control over the billing, "it was never suggested that [the Bigfoot Rendezvous] was on par with a scientific society that would put on a peer-reviewed event." Although the people invited to speak had professional credentials, Meldrum admits that he wouldn’t call all the talks scientific and that some put forth far-out ideas. "This is an aspect of the Bigfoot phenomenon that is unavoidable," he says. But, Meldrum adds that he doesn’t think science needs to be carried out by a PhD. To him, "science is just one way of knowing." As might be expected, Hackworth disagrees. Meldrum is now getting ready to head back into the field in Wyoming. He says this fieldwork, which he hopes will find some evidence of Bigfoot, is funded from a private backer he’d identify only as "an academic who is the custodian of a private fund." Hackworth is happy to take a critical look at any data that may arise. He adds that the controversy over the scientific billing of the Bigfoot Rendezvous was a little unfortunate, in light of his belief in academic freedom. "I particularly think its ok for people that I really disagree with to be involved with these things," he says, "but, while it’s not a physical improbability that Bigfoot exists, it’s a pretty low order of magnitude and in science I think that is how we do business."